I'm interested in work habits, hoping that I can use them--good ones, anyway--as an external support for willpower. We all want something that will help us to stay on task. What I've liked about habits/routines (when I've had them) in my own life, is that I find them time and energy saving in an additional way because I'm not wasting time and energy on making decisions about what I'm going to do, when I'm going to do something, etc. Thus, I am dragging you into this habit obse--arc. I've been reading The Power of Habit: Why We Do What We Do in Life and Business by Charles Duhigg and have spent much of the past week confused. The Power of Habit definitely isn't a self-help book that will aid individuals (this individual, anyway) in managing their own behavior. It's more of a big picture type of thing. In fact, it reminds me of Outliers by Malcolm Gladwell, using narrative nonfiction bits to illustrate factual material relating to general concepts. In the case of The Power of Habit, there's a lot of information on how habits impact businesses and social interactions/societies. Not great amounts of material that we can apply to the issue of work habits. And, as I said, what I did find and tried to apply, ended up confusing me. 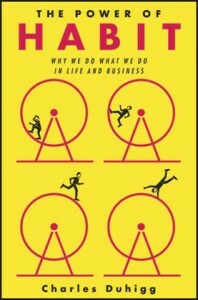 Duhigg writes about "habit loops." A habit, as he describes it, is triggered by a cue (often a time of day), we go through a routine (the activity of the habit), and receive some kind of reward for it. Because we were rewarded, the cue sets off the routine again. You can see how a habit loop forms with physical habits--eating in front of the TV, feeling uncomfortable if you haven't done your morning workout, for instance. The reward in those cases is physical, the way your body feels. You can also see the loop clearly in any habit that involves a reward you can actually observe or even touch. If, say, you are twelve-years-old and you have fallen into the habit of spending your allowance on comic books as soon as you receive it or you are a nineteenth century laborer and you have fallen into the habit of stopping at a bar on the way home on pay day, it's pretty obvious how those actions came to be repeated until they became the habit. Work habits, particularly for writers, seem different to me because the reward doesn't come immediately, and that's what threw me this past week. Isn't the obvious work reward payment or advancement in your field of work? They don't come all that frequently, so how does a worker form habits around them? And for writers, payment can come very rarely, indeed. Royalty checks only come a couple of times a year, and many writers don't receive them. They get their one-time advance, and since many books never sell enough to earn back that advance, that will be it. If I'm trying to use habits to help me manage my work time, how is that going to happen when my reward--payment--comes so rarely? Now Duhigg writes about monkeys who will maintain a habit after their reward is no longer coming, because they've come to crave the reward. He talks about the "power of cravings in creating habits." But, once again, is the occasional advance going to happen frequently enough for us to get used to it and crave more? Crave it enough to keep us working regularly? Perhaps money isn't the cue, I decided. Maybe it's just publication, because many of us publish work at journals that don't pay. Publication can come more frequently than payment, so maybe publication is the reward that creates a craving. Again, though, it doesn't come very often compared to the amount of work we have to do to get it. Is it really enough of a reward to help us form a work habit? I decided that maybe I was being too literal with the whole reward thing. Maybe I needed to be more mindful in terms of work, stay focused on the work itself, instead of something that may or may not happen (publication and payment) somewhere in the future. A fantasy future, the zenny ones might say. Maybe, for writers, at least, the work has to be the reward. Can the knowledge that work is being done be satisfying enough to be the reward for a work behavior? Is that how we form work habits? I suspect that that reward may be enough for some workers, but not all. And that may explain why not everyone has so-called "good" work habits. Duhigg provides a flow chart at his blog on changing a habit. He said he was going to post one on creating a habit as well. Unfortunately, he never created a blogging habit and hasn't updated in four months. Next week: We consider whether or not I've been going down the wrong road with this whole habit thing. Brilliant. Found it via this week's post, of course. I love this sort of exploration of work habits, even though I sometimes fear that my interest in looking at habits is part of my own procrastination from DOING stuff. Since reading Duhigg's book and watching Kelly McGonigal's habits talk, I've become very self-conscious about throwing around the word "habit." Timothy Pychol (sp? ), who also blogs for Psych Today, has written a great book on procrastination--another word that I'm more careful about tossing around, now that I've read something about the subject.